This Post has already been read 1262 times. Here is and interesting site for all those people like numbers and have interest in them beyond the usual and ordinary every day interation that we all have with numbers. The site claims that a user can enter any number, up to 9999, and the site will telll every bit of information that s related to the number known to man. 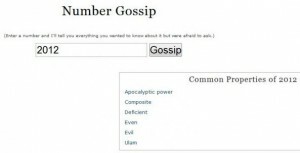 Beyond 9999, there is no number gossip collected by the site maker. It will tell you such things as rare and common properties of the numbers as well as unique properties. For some numbers there will be other mathematical facts related to them. For example, 100 is the fist number lexicographically if written in Roman. Hence, the site is indeed very interesting a must-visit for mathematics and number buffs. But it should bot be confused with numerology, which is entirely different branch of predictiv and speculative science. One word of caution is that not everything said here about numbers, especially of mystic nature is true.